There have been a number of media articles, social media posts and other communications regarding international trade in elephant ivory under CITES. This has resulted in many enquiries being made to the CITES Secretariat regarding the current rules and implications of the various proposals submitted to CITES CoP17. The purpose of this brief statement from the CITES Secretariat is to explain the current legal position under CITES regarding international trade in elephant ivory, as well as the legal process and consequences of the three proposals to amend the current listing of African elephants in the CITES Appendices that have been submitted by various Parties for consideration at CITES CoP17. All African elephants are included in Appendix I of CITES, except for the populations of Botswana, Namibia, South Africa and Zimbabwe, which are included in Appendix II. The normal CITES rules for Appendix I listed species is that commercial international trade in specimens taken from the wild is prohibited. For Appendix II listed species, the rules allow commercial international trade, subject to first obtaining the necessary permits. In the case of the African elephant populations of Botswana, Namibia, South Africa and Zimbabwe, a legally binding annotation to the Appendix II listing deems elephant ivory from these populations as being on Appendix I (even though the populations are included in Appendix II). As such, all commercial international trade in the ivory of African elephants is currently prohibited under CITES. The annotations to the Appendix II listing allowed a one-off commercial sale of certain stockpiles of elephant ivory from Botswana, Namibia, South Africa and Zimbabwe to China and Japan, which was completed in 2009. Under the annotation, no further commercial ivory sales can be proposed by these same four countries until 2017. Any future proposal to allow commercial ivory sales has to be submitted to the Conference of the Parties (CoP) for approval. Without the approval of the CoP, commercial international trade in elephant ivory remains prohibited under CITES. If there is no consensus among the CITES Parties on any such proposal, the decision will be determined by a vote, with a two-thirds majority being required to accept any proposal. What proposals have been submitted to CITES CoP17 to amend the Appendices for African elephants? Remove the existing annotations from the Appendix II listing as they apply to the elephant population of Namibia. If adopted, this would mean that the ivory from the elephant population in Namibia would no longer be deemed to be on Appendix I. It would be on Appendix II and hence it could be internationally commercially traded, subject to obtaining the necessary permits. Remove the existing annotations from the Appendix II listing as they apply to the elephant population of Zimbabwe. If adopted, this would mean that the ivory from the elephant population in Zimbabwe would no longer be deemed to be on Appendix I. It would be on Appendix II and hence it could be internationally commercially traded, subject to obtaining the necessary permits. 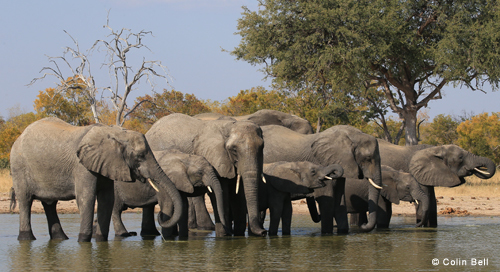 Include all African elephants in Appendix I, namely for the populations of Botswana, Namibia, South Africa and Zimbabwe to move from Appendix II to Appendix I. If adopted, this would automatically include elephant ivory in Appendix I, without the need for an annotation, meaning that commercial international trade in the ivory of the African elephant would (continue to) be prohibited. The full implications of this proposal require some explanation and are set out below. What criteria are used to assess the proposals to amend the Appendices and who decides? The various proposals referred to above will be assessed against the biological and trade criteria set out in CITES Resolution Conf. 9.24 (Rev. Conf. 16). 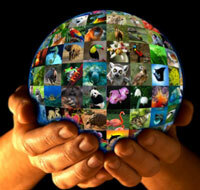 It will be for the CoP, made up of the 182 Parties to CITES, as a sovereign body, to take a decision on the proposals. If there is no consensus, the decision will be determined by a vote, with a two-thirds majority being required to accept the proposal. Would the inclusion of all African elephants in Appendix I change the current situation regarding international ivory trade? Moving the populations of African elephants of Botswana, Namibia, South Africa and Zimbabwe from Appendix II to Appendix I would not change the current prohibition on commercial international trade in elephant ivory. Nor would it change the situation regarding the right of any Party to submit any future proposal(s) to allow commercial international trade in elephant ivory, noting that the next CoP will be in 2019. What if a Party enters a ‘reservation’ against the inclusion of all African elephants in Appendix I? If the proposal to include all African elephant populations in Appendix I is adopted, then the Appendices will be amended accordingly, with the current Appendix II listing and its annotations being removed. The Convention allows any Party to enter a reservation with respect to this amendment to the Appendices within 90 days. Any Party that entered such a reservation would then “be treated as a State not a Party” to the Convention with respect to trade in specimens of African elephants, including ivory. As a result, a Party entering a reservation against the inclusion of all African elephant populations in Appendix I could commercially trade in African elephant ivory to any other Party that also entered such a reservation, and do so without violating the provisions of the Convention. All Asian elephants are currently listed in Appendix I of CITES and as such commercial international trade in the ivory of the Asian elephant is prohibited under CITES. This general overview only addresses elephant ivory and the proposals submitted to CoP17. It does not address other elephant related trade or the documents submitted to the CoP. Nor does it address the various exemptions under CITES, including those that apply more generally to pre-Convention specimens etc. Specimen is the terminology used by the Convention to refer to any animal and plant, live or dead, including part or derivative of a CITES listed species. There are various exemptions, including for pre-Convention ivory and ivory legally acquired prior to the prohibition. Such exemptions are not specific to elephant ivory and apply to all CITES specimens. Which meets once every three years. A number of documents proposing various decisions and resolutions have also been submitted but they are not addressed here. For a complete list of proposals and documents click here.